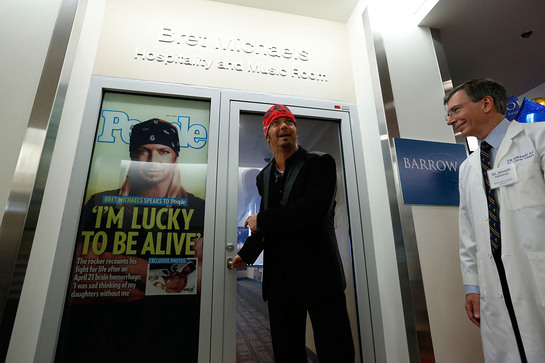 Bret Michaels, rock star and former patient of St. Joseph’s Barrow Neurological Institute in Phoenix, has officially opened the Bret Michael’s Hospitality and Music Room inside the hospital. The room, which has been under construction for nearly a year, is located near patients rooms and features relaxation areas for patients and their families. 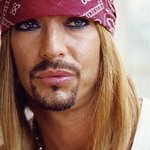 It is decorated with a music theme and features many of Bret’s personal music memorabilia as well as never-before-seen inspirational photographs from his life and work. Michaels was treated at Barrow in 2010 for a brain hemorrhage and says he owes his life to Barrow and Dr. Zabramski. The room, donated by Michaels, will be used for patients' families to relax. In 2010, Michaels was rushed to St. Joseph’s Hospital and Medical Center after suffering from a subarachnoid hemorrhage, a life-threatening type of stroke that causes bleeding in the fluid-filled spaces around the base of the brain. The hemorrhage left the musician in critical condition and he remained hospitalized at Barrow for the duration of his treatment. Joseph’s is the home of Barrow Neurological Institute and Michaels was treated by Barrow neurosurgeons. After being released from Barrow, Michaels made a rapid recovery and went on to win Celebrity Apprentice in 2010 and enjoy a successful national concert tour. He then returned to St. Joseph’s in 2011 to undergo a heart procedure to close a hole in his heart. To see Michaels thank Barrow, visit www.barrow50.org.